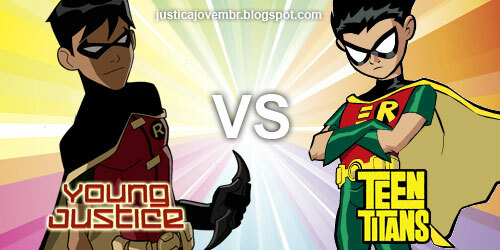 robin-young-justice-vs-teen-titans. . Wallpaper and background images in the Teen Titans vs. Young Justice club tagged: teen titans young justice. 3. has one of the BEST!!! nightwing costume ever when he's older!!! i mean have u seen it??? compared with the one on Batman:brave and the bold.